Similar to the long wavelength model, it offers the added benefits of gas purging input ports / output ports, a built-in cut filter for high order diffracted light, and a novel double speed mode which increases the sweep speed up to 2 times compared to the standard sweep mode. Due to the high resolution and sensitivity of the AQ6376, it can actually detect the presence of water molecules in the air. The water vapor is detected in the upper Near-IR wavelength region and could overlap with or mask the spectral characteristics of the actual device under test in that particular region. By continuously supplying a pure purge gas such as nitrogen to the monochromator through the ports on the back panel, the AQ6376 can reduce the influence of water vapor absorptions and provide more reliable and accurate measurements than ever before. By cutting incoming light below 1500 nm with the built-in filter, the AQ6376 drastically reduces the influence of high order diffracted light on the measurement. Thus, the measured data are always reliable and replicate the real signal under test. The AQ6376 covers not only the wavelength span used in communications, but also the 3µm region which is used for environmental sensing, medical, biology and industrial applications. The AQ6376 can measure optical power from +13dBm down to -65dBm thanks to its high-dynamic and very low noise components and circuits used for photo detection. This enables precise measurements of both high power and low power sources. The AQ6376 uses a double-pass monochromator structure to achieve high wavelength resolution (0.10 nm) and wide close-in dynamic range (55 dB). Thus, closely allocated signals and noise can be separately measured. With a proprietary sweep technique the AQ6376 achieves a much faster sweep speed than conventional measurement systems, which use a monochromator. Max. sweep time is only 0.5 sec. for 100 nm span. Applying a fast microprocessor, the AQ6376 achieves very fast command processing speed and Ethernet interface provides up to 100 times faster data transfer speed than GP-IB. The AQ6376 has a built-in reference light source for wavelength calibration and optical alignment of the monochromator components, allowing it to deliver always-accurate measurements. The calibration and alignment process takes less on the unit take than 2 minutes and is fully automatic. The AQ6376 uses a free-space optical input structure, i.e. no fiber is mounted inside the instrument. The AQ6376 has been designed to increase productivity of R&D and Production personnel. 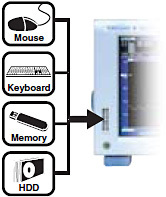 The software has pre-installed analysis functions for the most common optoelectronic (passive and active) devices. The automatic calculation of the major parameters of the device under test will contribute to its fast characterization. Moreover, the AQ6376 has the capability to be programmed to perform automatic measurements while controlling other lab equipment. Records analysis results such as distributed feedback laser diode (DFB-LD) analysis data and multi-peak measurements at up to 10,000 points per channel with time stamps. Reduces the noise on the measured spectrum. With this function it is possible to measure pass bandwidth / notch width from the measured waveform of a filter with V-type or U-type wavelength characteristics. It is possible to measure the Polarization Mode Dispersion (PMD) of a DUT (such as an optical fiber) by using the instrument in combination with an Analyzer, Polarization Controller, Polarizer, and an Amplified Spontaneous Emission (ASE) light source, High-output LED light source, or other wideband light source. 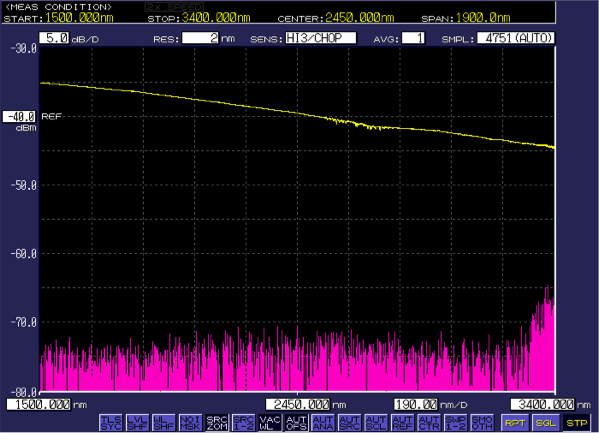 With this function it is easy to analyze WDM transmission signals. You can also measure OSNR of a DWDM transmission system with 50 GHz spacing. 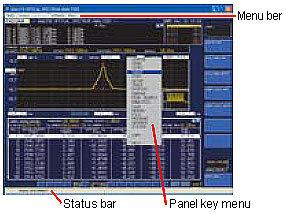 Measurements of WDM signal wavelength, level, wavelength interval, and OSNR can be made collectively on up to 1024 channels, and the analysis results can be displayed in a data table. Gain and Noise figure measurements can be made on signal light waveforms going into optical amplifiers, as well as light leaving the optical amplifiers. Optical filter characteristics can be measured from the measured waveforms of the light, from source, going into optical filters, as well as from the measured waveforms of light being output from optical filters. Analysis can be performed not only on optical filters with one mode, but also multimode filters (e.g WDM Filters). This function is used to measure changes over time in the level of a specific wavelength level. The sweep width is set to 0 nm, and measurement of the single-wavelength light is taken. The horizontal axis is the time axes. It is useful for purposes such as optical axis alignment when a light source is input to an optical fiber. The template function compares preset reference data (template data) with a measured waveform. In addition, if a function for displaying the target spectrum (target line) on the measurement screen is used, the target spectrum can be referenced while adjusting the optical axis of an optical device. The Go/No Go test function compares the active trace waveform against reference data (template data) preset by the user, and performs a test on the measured waveform (Go/No Go test). This function can be used effectively in situations such as pass/fail tests on production lines. The instruments perform the analysis of the signal contained into boundaries selected by means of line markers or zoomed area. 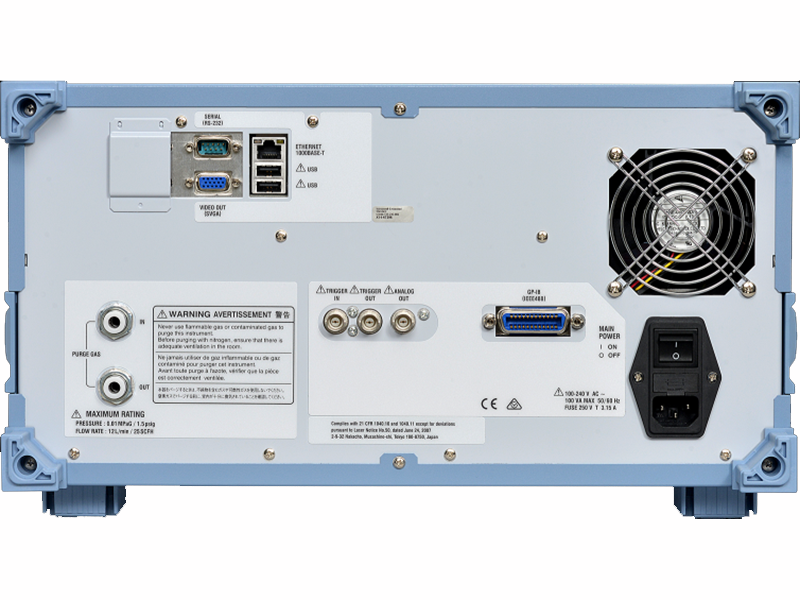 The AQ6376 is equipped with GP-IB, RS-232, and Ethernet (10/100Base-T) interfaces, which can be used for remote access and control from an external PC to build automated test systems. Built-in Macro Programming function is also available to implement simple auto test programs on the unit it self. 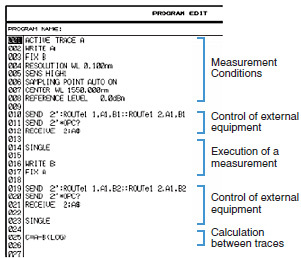 The standard remote commands of the AQ6376 are compatible with SCPI, which is an ASCII text based standard code and format conforming to IEEE-488.2. The AQ6376 supports proprietary remote programming codes of Yokogawa's best selling AQ6317 series for users to easily upgrade from their current automated test environment. Macro programming enables user to easily create test procedures by recording the user's actual key strokes and parameter selections. An external PC is not required because the macro program can also control external equipment through the remote interfaces. 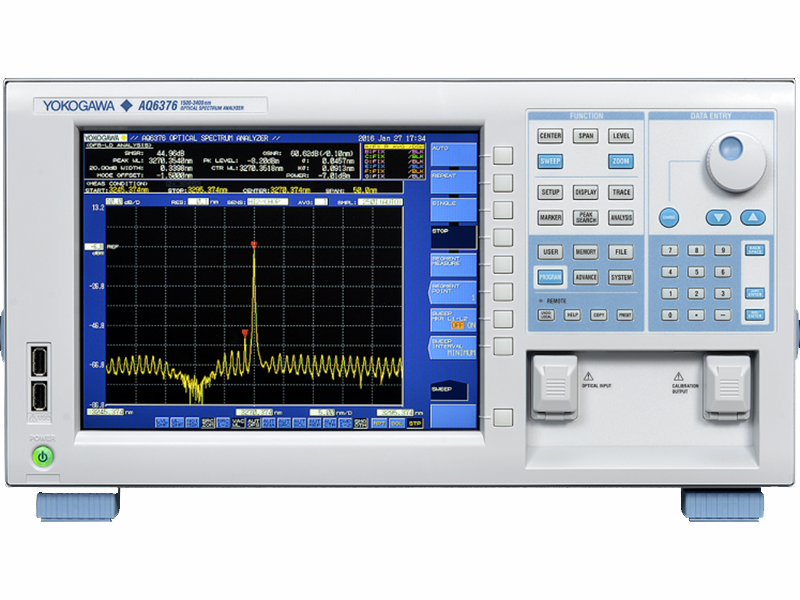 AQ6375B/AQ6376 Viewer is PC application software designed to work with Yokogawa's AQ6376 Optical Spectrum Analyzer. The software has exactly the same user interface and functions as the AQ6376 so that you can easily display and analyze waveform data. Allows to control AQ6376 from anywhere on the Ethernet network. Because of fast data transfer speed of Ethernet, measurement data can be updated in real time. Note: The data update speed varies depending on network performance and conditions. active optoelectronics devices like semiconductor LASERs and Supercontinuum light sources used in industrial, telecom and medical/biomedical applications and environmental analysis. Moreover, its peculiar characteristics and high-level performance make the AQ6376 the ideal OSA to measure gas concentration in the air using Laser Absorption Spectroscopy. A Fiber Bragg Grating (FBG) is a type of distributed Bragg reflector constructed in a short segment of optical fiber that reflects particular wavelengths of light and transmits all others. This is achieved by creating a periodic variation in the refractive index of the fiber core, which generates a wavelength specific dielectric mirror. An FBG can therefore be used as an inline optical filter to block certain wavelengths, or as a wavelength-specific reflector. The primary application of Fiber Bragg Gratings is in optical communications systems. They are specifically used as notch filters. They are also used in optical multiplexers and demultiplexers with an optical circulator, or optical add-drop multiplexer (OADM). Fiber Bragg gratings can then be used also as direct sensing elements for strain and temperature, in fact the Bragg wavelength of the FBG can be tuned by strain and temperature change applied by a piezoelectric transducer. Specifically, fiber Bragg gratings are finding uses in instrumentation applications such as seismology, pressure sensors for extremely harsh environments, and as downhole sensors in oil and gas wells for measurement of the effects of external pressure, temperature, seismic vibrations and inline flow measurement. Fiber Bragg gratings are created by "inscribing" or "writing" systematic (periodic or aperiodic) variation of refractive index into the core of a special type of optical fiber using an intense ultraviolet (UV) sources such as KrF or ArF excimer lasers. However, the functional wavelength of FBG is not the writing wavelength, and for non-communication applications mentioned above (strain and temperature sensors) FBGs tuned on 2-3µm region are used. 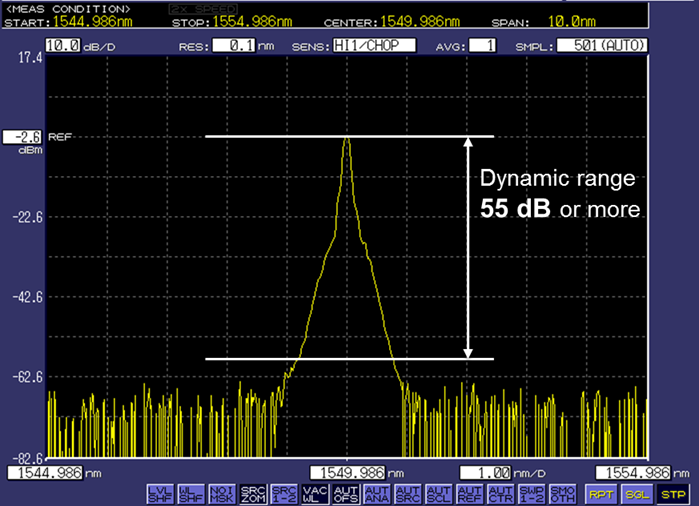 For testing such FBGs, the AQ6375B and/or AQ6376 are the ideal instruments depending on the wavelengths. Supercontinuum light is generated by promoting highly nonlinear optical processes in special materials, e.g. photonic crystal fiber, by pumping them with a mode-locked pulsed laser (typically a femtosecond Ti:Sapphire laser). Supercontinuum light can be best described as ‘broad as a lamp, bright as a laser', in fact it matches the characteristics of incandescent and fluorescent lamps - i.e. very broad spectrum - with the characteristics of lasers - i.e. high spatial coherence and very high brightness, which enables optimum coupling to a fiber and outstanding single-mode beam quality. The Supercontinuum light sources are nowadays finding applications in a diverse range of fields, including optical coherence tomography, frequency metrology, fluorescence lifetime imaging, optical communications, gas sensing and many others. Detecting the multi-wavelength optical pulses generated by a Supercontinuum light sourcewith AQ6376. AQ6376, thanks to its premium performance, is the right instrument to tests and characterize Supercontinuum light sources during their production and after-production quality check processes. Specific LASERs emitting around 2µm are used nowadays as tools for endoscopic surgery, like Thulium laser used for surgical treatment of prostate cancer. AQ6376 is the best instrument to test and characterize such kind of LASERs during their production and after-production quality check processes. The global warming gases, called greenhouse gases, like CO2, SO2, NOX and CH4, has strong absorption lines in the 2µm wavelength region. The presence and concentration of those gases in the atmosphere can be determined by measuring the optical absorption spectrum of the gas mixture under test. 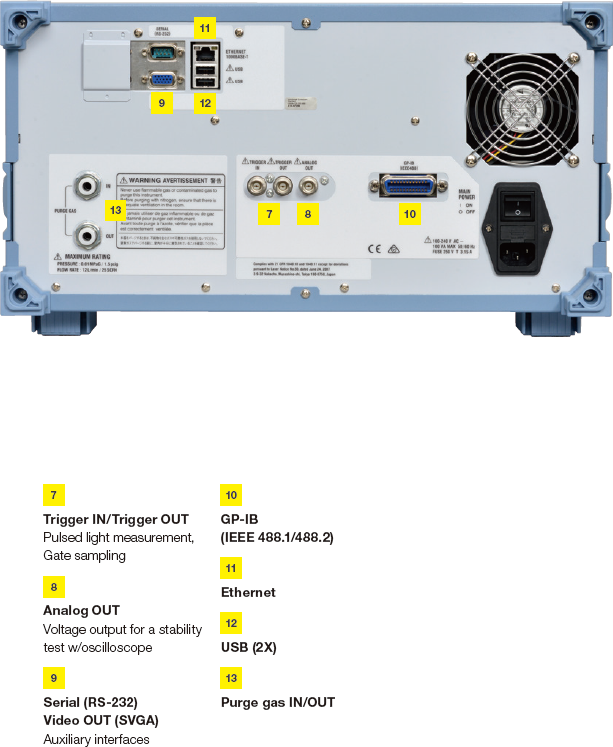 Thanks to its Free Space Optical Input, the AQ6376 can also measure the absorption spectrum of an air column using the Sun as light source and transferring by a MultiMode fiber the light passed-through the mixture. CRDS is a highly sensitive optical spectroscopic technique that enables measurement of absolute optical extinction by samples that scatter and absorb light. It has been widely used to study gaseous samples, which absorb light at specific wavelengths, and in turn to determine mole fractions down to the parts per trillion level. The technique is also known as cavity ring-down laser absorption spectroscopy (CRLAS). A typical CRDS setup consists of a laser that is used to illuminate a high-finesse optical cavity, which in its simplest form consists of two highly reflective mirrors. When the laser is in resonance with a cavity mode, intensity builds up in the cavity due to constructive interference. The laser is then turned off in order to allow the measurement of the exponentially decaying light intensity leaking from the cavity. During this decay, light is reflected back and forth thousands of times between the mirrors giving an effective path length for the extinction on the order of a few kilometers. If something that absorbs light is placed in the cavity, the amount of light decreases faster-it makes fewer bounces before it is all gone. A CRDS setup measures how long it takes for the light to decay to 1/e of its initial intensity, and this "ringdown time" can be used to calculate the concentration of the absorbing substance in the gas mixture in the cavity. Cavity ring down spectroscopy is a form of laser absorption spectroscopy. In CRDS, a laser pulse is trapped in a highly reflective (typically R > 99.9%) detection cavity. The intensity of the trapped pulse will decrease by a fixed percentage during each round trip within the cell due to both absorption and scattering by the medium within the cell and reflectivity losses. The AQ6376 has the right characteristics to be an effective instrument to measure the output of CRDS systems. For the first time, the AQ6376 is now equipped with Gas Purging Input and Output ports for the first time along with a suite of electrical interfaces (GP-IB, RS-232, USB, RJ-45 Ethernet, SVGA video output, analog (voltage) output, trigger input & output) which allow the user to easily operate it locally in the lab as well as remotely. The AQ6376 adopts a universal type optical connector system for optical input and calibration output enabling direct coupling to major optical connectors (FC, SC or ST). The connectors can be replaced by users. Note: USB ports can't be used for instrument's remote control. For this purpose the instrument has an Ethernet RJ45 port on its back panel.